You haven't generated any Question Paper! Kindly login to view your generated testpapers! Why to use online test generator? We update our Question Bank regularly. We strictly follow CBSE marking scheme and blue print. 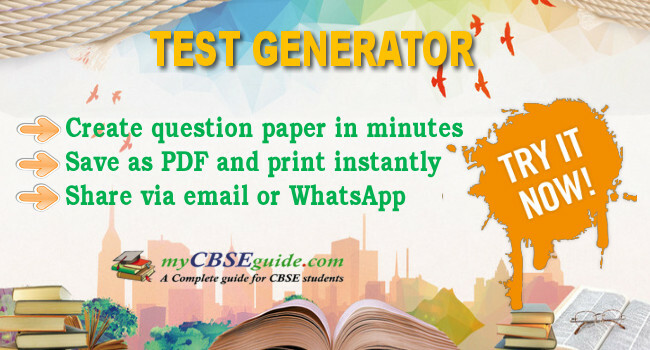 CBSE Test Generator helps you to create question paper online in few minutes with your own name and logo. Just upload your logo, select questions from our question bank, preview and download the question paper with solution in PDF format. You can create papers for CBSE class 6 to 12 in all major subjects. All these tests follow the latest CBSE marking scheme and based on Bloom's taxonomy learning objectives into levels of complexity and specificity. In Generate new question paper section, click start button. Now select your course, class and subject. Add questions, choice to the question or add new section to the question paper. Once all questions are added. Click preview and finalise questions. You question paper is ready to generate. Click generate question paper and download it as PDF. Online Test generator for CBSE exams can create a full-length question paper with solution in minutes. This question paper creator is a freemium product developed by myCBSEguide for CBSE teachers, parents and students. Now teachers, schools and institutes can generate and print best quality question papers with their own name and logo. The whole process takes hardly few minutes to print the customized test paper. Questions papers are available online but I need them with my name and logo. It is possible? Yes, with the help of myCBSEguide test generator, you can generate papers with you name and logo. I need very customized test from selected chapters only. Is it possible? Yes, you can select questions from any chapter or from whole book. Can we print them with our school’s name and logo? Yes, you can print question papers with your school’s name and logo. Can I print the question papers created through online test generator? Yes, these all are available in PDF format. You can print and share them. What if I lost the downloaded copy of the question paper? Just login to test generator page. It is saved there. You can download it any number of time. How can I pay for the test papers? You can pay online using PayTM, credit card, debit card or net banking. Will I get the download link instantly? Yes, you can download them immediately after payment.